I'm interested in getting a XvoStick mod (clone) and am looking for a tank to fit. I vape mouth-to-lung and really like Aspire BVC coils. They're basically mini cartos and suit my style of vaping perfectly. So I'm looking for a shorter 22mm diameter tank that can use pre-made coils suitable for mouth-to-lung hits. I'm hoping to find a tank will be so short the driptip just pokes out the top of the mod. Preferably a metal tank that can handle a drop. Any suggestions for the tank, and coils to use with it? I really only want to consider pre-made coils, I have a stupid life where 5 minutes to scratch myself is a rare treat, so don't get much time to invest in vaping as a hobby. Thanks for reading, will appreciate any advice I can get. Pretty sure you can use your coils in it too. Looks great except a little taller than I'd hoped. At 55mm it's only 4mm shorter than the Nautilus (59mm). Still worth a look. Would love to hear other suggestions too. Aspire triton mini takes the nautilus coils as well as the new nautilus coils that should be available soon. 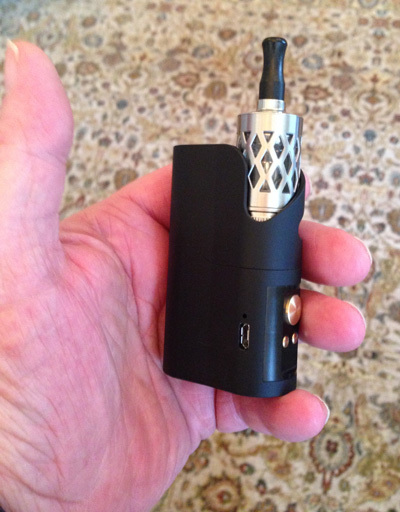 The tank is only available as part of a kit Aspire Odyssey Mini Kit at the moment. Knowing Aspire it wont be to long till they make available the ss sleeves like the one in your photo. I'm sure the tanks will be available on their own before the christmas rush. The full kits are available from vapour eyes I'm sure last time I checked. Just checked the size 86x16 sorry..
Jon Snow and Holmesy like this. I suspect using nautilus BVC coils may not be an option for the height I'm after. I'd be willing to try something else so long as it's easy (pre-made coils). Thanks. I will try this for sure. Great suggestion. I'd already looked at the Ego One Mini but didn't realise this tank was so short. Jon Snow and steve.c like this. It's a great tank, I have it in my daily rotation. Holds approx 4ml and I use the clr rebuildable 1ohm coils That I never really rebuild only dryburn and rewick.